Bitten by the Hollywood bug? Think you have an idea for the next number-one hit TV script? Wonder how to write a video script? All writing begins with the basics, including screenplay writing. If you're wondering how to write a screenplay, then you should know that WhiteSmoke English writing software will help you with the most important part: the writing! Many people have a great idea, then wonder how to write a great script using that idea. If you are thinking of selling your screenplay, it will need to be written in the best English. One thing for sure, the way not to write a screenplay is to leave it full of errors! 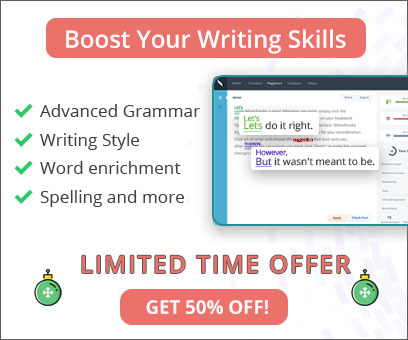 WhiteSmoke writing enhancement features, including its synonym finder, an online dictionary, grammar check, and spelling check can help you present your ideas in your best English. A screenplay has unique features when compared to other forms of writing. The features require special formats, depending on whether the script is a movie script or a TV script. A screenplay is written with acts and scenes, like a play. Each scene has a brief but detailed description of the setting, including time of day, location, season of the year, who is present, even where the camera is focused. Each act is a collection of scenes that tell a significant part of the story. Movies are often divided into one, three or five acts. The first act introduces the main characters and their lives. A one act is a short film script, and everything happens in that one act. It is usually set in one location, or at most a limited number of locations. Short films and most TV scripts have a smaller number of characters and fewer complications. If there are more than one act, the acts between the first and last provide complications and difficulties that the main characters overcome--or don't. Usually, these grow in significance until it appears that all is lost. Then the main character of a movie script usually finds a solution. In a comedy, the complications are usually funny or poignant. In a drama, they usually create tension and difficulty. A tragedy leads toward an unhappy end, so the complications and difficulties usually cannot be overcome in the end, or overcoming them leads to bad results. If you want to know how to write a horror script, think of each complication as a growing terror, a dark surprise lurking in each scene, each horror movie scene usually eliminating at least a minor character and increasing the fear of the remaining characters. The last act of almost every movie "wraps up the story," making sure all loose ends are explained and the main characters are accounted for. In tragedies or horror movies, the main characters might have died. In comedies, they often marry each other. An experienced screenwriter may switch around the order of these acts--starting in the middle of a complication, or at the end, for instance. However, the main elements remain. Experienced screenwriters also know the importance of using spell checking software, grammar software, a thesaurus, and a dictionary. They like respected others to check their work and suggest language enhancements. 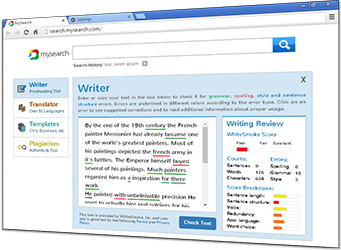 WhiteSmoke English writing software includes all of these features in one package. Use it to improve your screenplay writing. If one or more of your characters will be using words from a language other than English, you should also check out WhiteSmoke translation dictionaries. Movie and TV scripts have special formats and unique requirements. Be sure to consult with an authoritative reference so that you use the correct format. A script must also be perfect in its grammar and spelling. WhiteSmoke grammar check and spell check will assure your film script find success on its way to Hollywood!